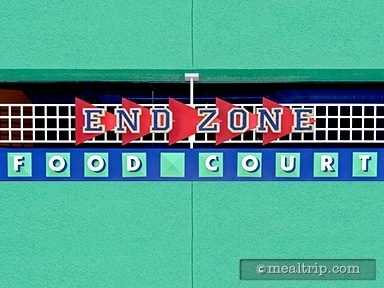 Disney’s All-Star Sports Resort only has one, full-on restaurant and that would be the End Zone Food Court. 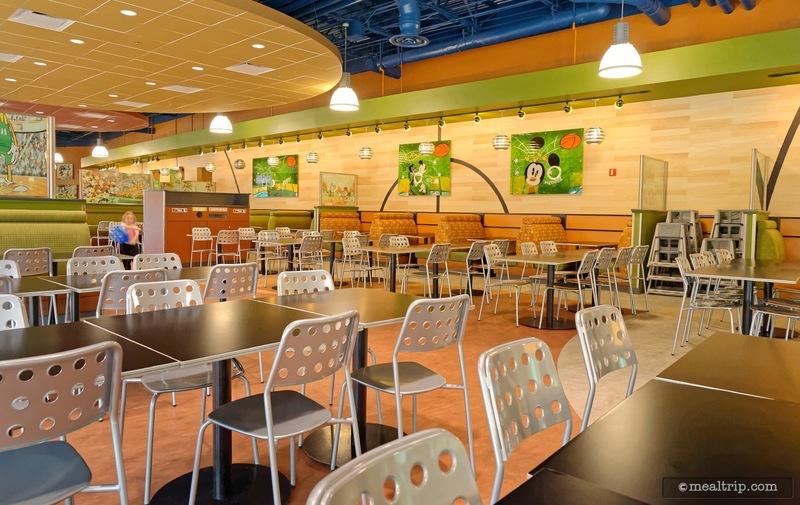 Located at the end of the very long guest check-in area (and down the hall just a bit),the large eatery can get a little busy at peak dining times but if you time it just right, the environment in this large location gets more relaxing. The lunch and dinner menus are similar enough for us to consider this as an all-day menu. Standard items such as pizza, burgers, hot dogs, a couple of salads, and grab and go items (from a refrigerator unit) are commonly available from 11:00am until 12:00am (although some stations do start closing around 10:00pm). There are usually two or three (or more) soups available, and could include a New England Clam Chowder, Chicken and Wild Rice, Tomato Basil, and a Potato Cheese Soup, just to name a few. The lunch period has a few more sandwich type items that include a Cajun Mahi Sandwich, Chicken Quesadillas, a Turkey & Muenster Focaccia, and a Grilled Chicken Sandwich. For the dinner period, some of those sandwiches are replaced with a baked chicken, salmon, roast turkey, or roast pork plate, (served with two sides), a Chicken Pot Pie, Beef Pot Roast, a Shrimp Creole plate, and a Mahi Mahi entree. All the time, the bakery station has some desserts ready to go, but there seems to be more here for breakfast, than later in the day. Options include a Crumb Cake, a Brownie, Assorted Cookies and Muffins.